There is an interesting article on Altar Cards & Last Gospels. The image above shows the extreme caricature, of extra-large cards presumably for a priest with poor eyesight. 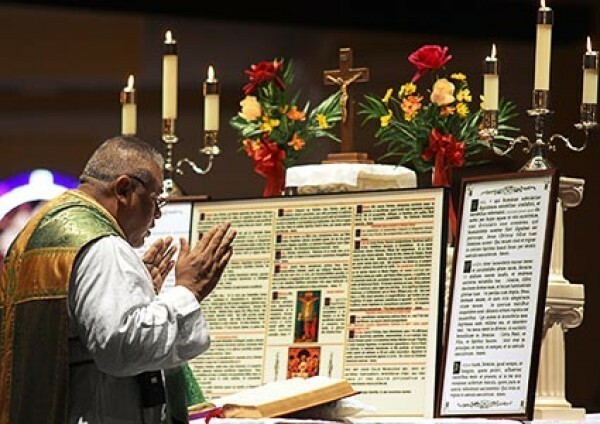 The three altar cards have become as traditional a feature of post-Tridentine altars as vases of flowers, central tabernacles (often enormous in size with a throne for the monstrance) and gradines. I won’t “meme” Rad Trad’s article here. You can read it directly through the link above. I still have a small sheet of paper lying on the altar near the crucifix (I have a hanging pyx) to act as a prompt for the offertory prayers and the placeat prayer. My altar is so nice and uncluttered without altar cards. Same with flowers – I won’t have them on the altar, just a single vase away from the altar for major feasts. Murphy’s Law often dictates that you forget the words of something when you don’t have at least a “prompt”! I could make do simply with having the order of mass available, but the bit of paper is practical. Occasional celebrants of a given rite of Mass need more, and turning to the relevant page in the missal is awkward. It is understandable how altar cards came about. However, I do think there is something wrong when they are excessively large or decorated. The Last Gospel said at the altar was an innovation of 1570. Prior to then, the Prologue of St John was said from memory by the priest on his way back to the sacristy after the end of Mass as a private devotion, as in Pontifical Mass in the Roman rite. Sarum is no exception to the pre-Tridentine rule. One trick is to learn the first few verses, pause while getting to the sacristy and resuming from a card or paper. I don’t find it easy to learn texts by heart, so I sympathise with these practical aspects. This entry was posted in Uncategorized and tagged Liturgy. Bookmark the permalink. It is a good example of how what is inesential and in this particular case merely an aide-memoire become symbols of somthing else. Disproportionate cards, cards mounted in huge, gilded, ornate frames become perceived essentials to a style of celebration. The next stage up from the one in the picture is a teleprompt, or screen with a bouncing dot. I love altar cards, and cannot even imagine saying mass without them. I really fail to see why this is even an issue. Oh, even the Byzantine Orthodox have altar cards, they are placed on the altar of the prothesis so that the priest can do the manual actions of the offertory preparation (the old priest at my Mother’s parish, because of his eyesight, had ones as large as those portrayed here), which takes two hands, without having to refer to the hand held book of the liturgy (Liturgikon). In an Orthodox seminary we were taught to never recite any prayer of the liturgy from memory, but that all had to be read. In the Byzantine rite, the priest does not repeat the prayers of the choir, but during the singing of the liturgy there are many, many private prayers to be said by the priest, and the tradition is for the priest to read directly from the Liturgikon (Even if he has these memorised) containing only the priestly and deaconal prayers of the liturgy. In more traditional Orthodox parishes, even when singing the Words of Institution, the Words are said whilst reading the Liturgikon (it is a Greek Catholic affection to point at the bread and chalice whilst singing the Words of Institution); the consecration is always said silently, whilst being read from the liturgikon; never from memory. I suppose it’s different for me, using Sarum. Our offertory is much shorter, there is no “Last Gospel” (the Prologue of St John is said quietly by the priest on his way back to the sacristy) like in the Roman pontifical Mass. The priest washes his hands with a single verse and not the Lavabo psalm. With all that, I have a very small card laying flat on the altar to the left of the crucifix – there for when I need it. Most often, I read the offertory prayers rather than recite them from memory. Many of the other prayers on Roman altar cards are redundant because the missal is open at the right page when those prayers are said. To me, there is nothing wrong with altar cards, but they go with the “Big Six”, tabernacles and gradines. I was a seminarian at Gricigliano and was completely “Tridentine”, and continued for some time after leaving the Institute of Christ the King. Eventually, my Anglican background and love for the “Dearmer” style won out, together with French monastic influence. I have diverged in another direction. In most churches of my ACC diocese, the altars are in Roman style, and I don’t say they are wrong. They just aren’t “me”. The aesthetics of the baroque and 19th century are a different tradition than what came out of English medievalism and the Arts & Crafts movement. There is certainly room for both. The reference in America for “missal” Anglicans, like in England, is the Counter Reformation rather than the “gothic” movement from the influence of Romanticism, the Pre-Raphaelites and the Arts & Crafts. Two different worlds. Very true Fr Anthony. Personally, I really like both traditions and I refuse to think that such issues are really very important. I also do not mind mixing the two traditions either, as is done in many Anglican churches where one can find an “English” altar with six candlesticks, a tabernacle, and altar cards. I also get tired of those who think that a Gothic or fiddleback vestments are theological issues. I have to admit that I still use the fiddleback vestments I used when I celebrated according to the Roman rite. I hope to find time to make some gothic vestments. No, these are not theological issues, purely aesthetic and cultural. The singing of the entire anaphora was the Greek practice for most of history, although its restoration in Greek Catholic Churches is debatable. Many do not do it. They did not, however, innovate in the gesturing at the bread and wine. I have yet to see an Orthodox priest who does not gesture at the gifts or who does not sing the Institution narrative aloud (although the epeclesis is always silent). I would think given the expense of making books and the scarcity of resources in rural settings, the priest usually had the Canon committed to memory in the first millennium until the invention of the consolidated Missal (condensing the lectionary, sacramentary, and some of the antiphonary). Hello Rad, just because Orthodox priests are now doing the pointy, does not mean it is traditional. When I was young, about fifty years ago (I am indeed ancient of days) our Russian trained, pre-Revolutionary, priests usually stood at the altar with their hands palm down on the altar, outside of the antimensium, and sang the Words of Institution. There are no rubrical directions for manual acts at this juncture of the Canon of the Liturgy. Hence, in seminary, and I went to a very liturgically conservative one, we were expressly told that the use of pointing was from the Greek Catholics and that is should not be done. In the United States and Canada, where the vast majority of Slavic Orthodox came from Greek Catholicism it is widespread and is the first place I saw this action; I have also seen an older Ukrainian Orthodox priest actually touch the Agnetz with both hands, and sing the first part of the Words of Institution directly towards the bread and do the same with the chalice, following the directions for this moment found in the Roman Missal (Personally, I do not find any of this earth shattering, but if one accepts the the moment of change as the Epeclesis this manual act does not seem to align with the theology). There are several other Greek Catholic influences that are now becoming increasingly popular in Orthodoxy as well, one of which is the full Canon being said aloud with the whole congregation saying the triple Amen after the Consecration, this is normally said silently by the priest or deacon (During the Epeclesis there are indeed rubrical directions, the deacon points at the elements whilst the priest makes the sign of the Cross over them whilst saying the Words of Invocation of the Holy Ghost). And funerals now being sung with white instead of black vestments. And a growing confusing, especially amongst the converts, between kneeling and prostrations. In Russian pontifical services, it is the tradition to have someone carry the Pontifical Liturgikon for the celebrant to read from. As a child, it was a job I hated to do since so much of a pontifical liturgy takes place in front of the ikonostasis, and any mistake is noticed. The other one I disliked was being responsible for the orlitzi; again too easy to make mistakes with everyone, including the bishop, waiting for one to put the rug in the right place.